Grew up… in Los Angeles, with his mother, father, and older brother Don. From an early age, Charlie showed fantastical skill with math, even attempting to find a base-12 narcissistic number in second grade. Though his brother, Don, is five years older than him, they graduated high school at the same time, and Charlie went on to Princeton. Living… in his father’s house. His mother recently died, and Charlie spent the last three months of her life hiding in the garage, working on a famously difficult math problem, P=NP. While Charlie has since emerged into the "real world," he still spends much of his time in a world of his own, where everything is reducible to an equation. Profession… mathematics professor at Calsci (the fictional version of Caltech), and now consultant for the FBI. 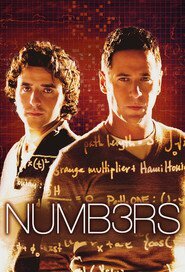 Charlie can hardly pass up a chance to solve a new problem, and when Don gets a difficult case from the FBI, Charlie starts working on an algorithm to catch suspect. Ever since then, he’s been using his math skills to crack the FBI’s most difficult cases. Interests… math, but any and all learning. While pure mathematics is Charlie’s specialty, he also enjoys learning about physics, computer science, biology, and more. But while he's fantastic at chess, Charlie’s awful at Scrabble – he can’t spell. Relationship Status… oblivious. There might be something going on with fellow genius Amita, if she could get him to get his head out of his books. Challenge… balancing the FBI, his research, and regular life. Charlie has the potential to do almost anything, if he focuses hard enough. But how can he choose? On the one hand, he’s saving lives with the FBI. On the other hand, he’s running out of time to make a difference in the field of mathematics. Between those, it’s no wonder he can barely understand other people. Personality… brilliant and well-meaning, but socially awkward. Charlie sees everything in terms of numbers, and he knows he can conquer any equation given enough time. People, however, are a math problem he's still working on. Still, Charlie's friendly enough, and his intense focus and almost childlike enthusiasm for knowledge are charming enough to make up for his poor social skills. Charlie Eppes's popularity ranking on CharacTour is #2467 out of 5,000+ characters. See our top-ranked characters and read their profiles.